Devil Man Reproduction!! #2 of 6 | BAD'or'RAD Reviews! This all started one day when I walked into arcade legacy, asking the owner if he knew anyone that could translate a game that had no playable ROM. 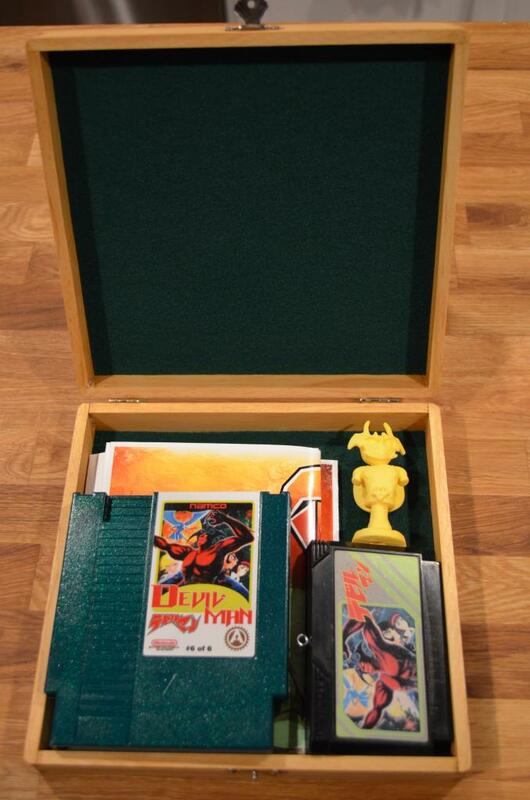 It happened to be Devil Man on the Famicom. We started chatting about it a while, and he decided that he would start an actual project of making it happen! So, if you want to check it out. Below is his information on the game that just ended it’s auction on www.nintendoage.com last night. 12/18/14. “Hello all and happy holidays! I am a big fan of reproduction games and especially the Limited Edition ones that people put some hard work into. I wanted to do one myself, specifically for a game that may not have really been repro’d much if any in the past. My buddy suggested the game Devil Man. While not an amazing game by any means, it’s a rad character and I thought I could do something pretty cool with it. This isn’t a game that is ideal to repro as it requires a Famicom adapter along with the reprogramming of the rom into English. That is why this is such a small run. That and the fact that I had to put up a fair amount of money to get everything made. Now on to the goods. This set comes housed in a cigar box (just like the Free Fall and I think Lady Frogger). They are customized with the Japanese Devil Man logo and the Limited Edition number. The inside is lined with green felt. Inside you have the sparkly green painted cart with label that also corresponds with your number. Next we have the original Famicom cart that has been turned into a Christmas ornament. Then the true works of art. First we have a 3 inch 3D sculpted and printed bust of the chibi version of Devil Man done by Michael “Crash” Adams (who has done work for Image comics). Each limited edition will have a different color with #1 getting the full color figure. Rules below. And finally we have a very cool 16″x20″ poster/print done especially for this release by Quentin Ross. Both the figure and poster were comissioned by me specifically for this release and will not be available elsewhere.